An exciting week lies ahead, with a whole cluster of works – nine, in fact – to perform in the space of four days. The Quatuor Mosaiques are focusing on the string quartets Mozart dedicated to Haydn, and together we’re playing a Haydn Trio and a Mozart piano concerto using a quartet instead of an orchestra. In the middle, I’m doing a solo piano recital of works by Haydn and Mozart. Rehearsals begin this week and I’m so looking forward to an intensive period of music-making with a group of musicians I very much admire. 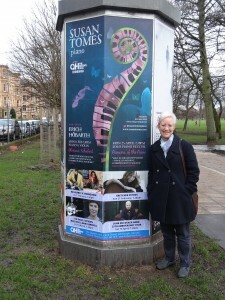 When the final concert is over, the quartet’s first violinist, Erich Höbarth, and I will make a dash for Edinburgh and a totally different programme to be performed on the very next day (see photo of me standing beside a concert poster). This is the all-Schubert programme of duo sonatas which we gave in Wigmore Hall last year. On this occasion we’re playing in the Queen’s Hall in Edinburgh, familiar to both of us from our visits over the years with different groups during the Edinburgh International Festival. Please come along if you can on 15 February! When we put together our Schubert programme we decided to include the much-feared ‘Fantasy’, one of Schubert’s sublimely imaginative works which appear oblivious to how difficult it is to get one’s fingers round the notes on actual instruments. In the Fantasy there are, essentially, four movements in a continuous sequence, and every one of them presents high-level challenges of different kinds. Not that the listener is supposed to be aware of that, however; it’s clearly all meant to seem like angels tumbling about in airy realms. Erich Höbarth has long been one of my favourite musicians and I always learn a lot from his approach to music-making. He has a wonderful, very Viennese sense of how to make things feel natural and idiomatic, taking care to ensure there’s always room for playfulness and flexibility as well as repose. This entry was posted on Sunday 7th February 2016 at 10:54am	and is filed under Concerts, Inspirations, Travel. You can leave a response, or trackback from your own site. How wonderful! Will you be playing a fortepiano when you play with the Mosaïques Quartet? The name should be “Matthew,” by the way. Sorry about the typo. Good question, Matthew! In fact, because the concert hall is so large, and because it has an excellent Steinway piano, we decided on this occasion to use it. It’s an unusual situation for the Mosaiques and I think they’re just being kind to me really! The fortepiano would undoubtedly be very hard to hear in such a large venue, and probably frustrating to play for the same reason. Thanks for letting me know. Have you played a fortepiano in concert? I’d be very curious to know your thoughts about it.